Many of our favourite Rock vocalists aren't technically the greatest of singers – Joe Elliot, Stephen Pearcy, Vince Neil, Don Dokken – the list could fill this entire review's word count. Does that mean Def Leppard, Ratt, Mötley Crüe, and Dokken would have sounded better with someone else at the helm? Not at all! Each and every aforementioned singer has been perfectly "imperfect" in contributing to their respective act's unique, distinctive and much-loved sound. Yet the genre nevertheless does indeed contain a rare strain of magnificent singers that transcend categorization; at the head of that particular table presides Ronnie James Dio with Steve Overland sitting close enough to refill the great man's wine glass. Away from FM, Overland's catalogue (So!, The Ladder, Shadowman, Overland) has comparatively underwhelmed as, although his voice has never been anything other than majestic, the overall material has generally felt a touch homogeneous and safe. 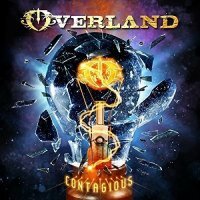 'Contagious' bridges the gap between past Overland releases and FM's better output. Although opener 'Doctor My Heart' has a classy, Bluesy vibe, it takes track two, 'Easy On Me' – in the infamous words of a blundering MP – "to get this party started". Opening with an almost Dance-like synth line that calls to mind a not dissimilar approach employed on FM's 'Only Foolin'', the number morphs into a smooth, driving AOR treat with Overland in utterly exquisite form. All guitars (and most keys) are handled by the prolific Tommy Denander who, aside from possessing his own precise, crisp style, has the ability to bring to mind the characteristics of other distinctive players such as Eddie Van Halen on the clean, trebly intro to 'Intoxicated' while the sweetly fluid lead playing on 'Wildest Dreams' is particularly reminiscent of Richie Kotzen. 'Making Miracles' revisits the Blues Rock feel of the opening number; it's a style which Overland's voice is inherently suited to while Tony Franklin's (The Firm) silky bass propels the track along superbly. This is as good as FM's recent 'Heroes And Villains' and 'Rockville II' but not quite up to the level of post-reform landmarks 'Metropolis' and 'Rockville'; if you're awaiting an all-new FM album then 'Contagious' is well worth catching.